The number of people using mobility equipment to get around is expected to rise in the near future. Taking mobility equipment on public transport can be such a big hassle, and many people with mobility problems are reluctant to use public transport for this reason. Because of this, they restrict themselves to using shops in the local area, or rely on others to do their shopping for them. In some cases, mobility equipment is used instead of going on public transport, although this only works if you are not going to be travelling far. This article looks at taking mobility equipment on public transport, such as buses, trains and planes. Research conducted by Travel and Transport Research for the Department for Transport found that although many people using mobility equipment were understandably keen to take their mobility equipment on public transport, they were unwilling to do so because they fear being refused entry. This is particularly the case for those who use mobility scooters. Most models of mobility scooter are not suitable for using on public transport due to their size and manoeuvrability, but some models are the exception to this. Most train companies can cater for mobility scooters that are light, compact and can fold up to save space. However, this is at the discretion of the train companies, and they can refuse to allow mobility scooters on board. To safely access wheelchair ramps, mobility scooters and powered wheelchairs should be no wider than 670 mm, no longer than 1200 mm (including footplates), and no heavier than 230 kg. For mobility scooters or powered wheelchairs that do not fit these dimensions, you will have to contact the train company in question to see if they will still allow you to take it on board. Some train stations will not have wheelchair ramps, so it is best to contact the train company before you travel to ask whether that will be the case. There are several public transport systems in the UK that allow mobility equipment on board. These include the Midland Metro (a tram network which runs between Birmingham and Wolverhampton), the Croydon Tramlink (which is fully accessible by disabled passengers), the Stagecoach Supertram in Sheffield, Tyne and Wear metro and the London Underground. 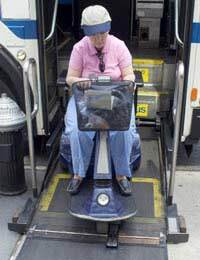 There are usually no wheelchair ramps to help you get on buses and coaches on mobility equipment, so you need to be able to get on and off the vehicle without them. Arriva buses are sometimes wheelchair accessible, but they will rarely allow mobility scooters on board due to their tendency to topple over when the bus goes around corners. However, this may be reviewed in the future as and when they become available in more compact sizes. First Group buses also refuse to carry mobility scooters on board. If you want to take mobility equipment on board National Express coaches, you should contact their Disabled Persons' Helpline and inform that of your journey dates. They will also need to know the model of mobility equipment that you wish to take to decide whether it will be accommodated. It must stay in the hold during the journey. If you are unable to get the mobility equipment in and out of the hold, you will need to have someone to help with this. Some taxi drivers will allow mobility equipment to be stowed in the boot during journeys, but this is usually at their discretion, and depends on how big the mobility scooter or powered wheelchair is, and whether it can fold up.